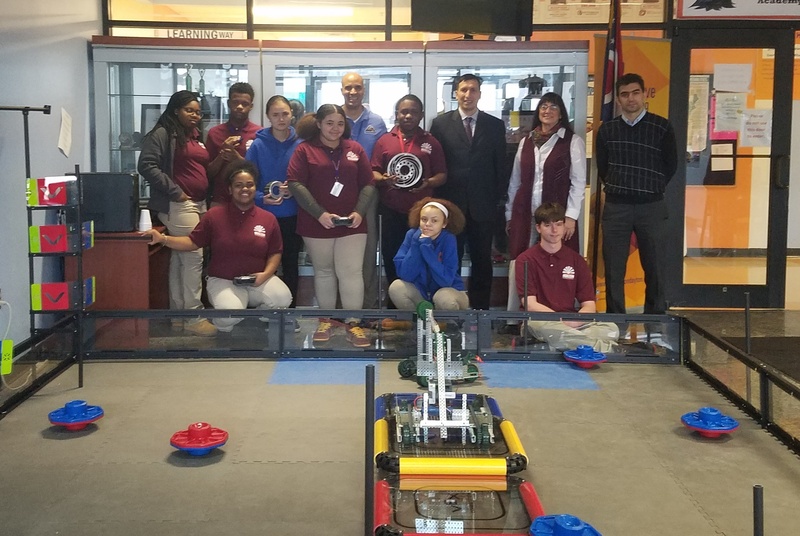 HSA Dayton High School had a special guest visitor on Tuesday February 5, 2019, Kobie Boykins, whose expertise is higher than the sky. 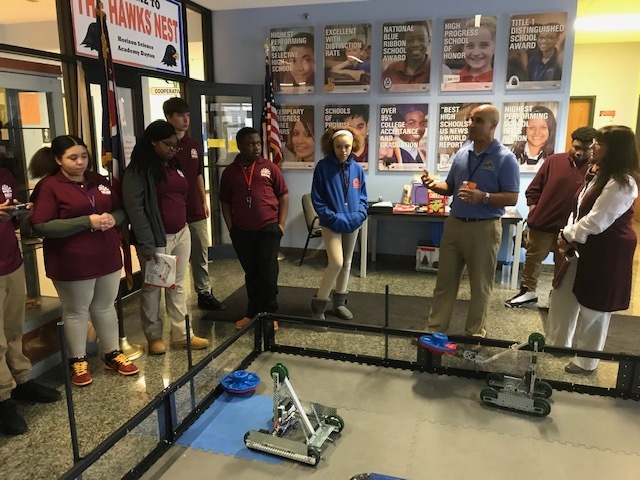 Kobie came to us from NASA’s Jet Propulsion Lab, or JPL, in Pasadena, California, where he is a senior mechanical engineer for the Mars Rovers projects. He loves building flight hardware and pushing the limits of the knowledge base of the mechanical field as it applies to space exploration. After graduating from high school in Nebraska, Kobie moved to upstate New York and attended college at Rensselaer Polytechnic Institute. During his time at R.P.I. he was offered a co-op position at JPL. He took the position and the cast was set. He didn’t want to work anywhere else after graduation. While a student working at JPL, Kobie worked on the Mars Pathfinder project helping with the stability of its mobility system and building the rock stand used to test the air bag in the drop test for the Pathfinder’s mission, as well as an interface test with the bridle and airbags, called the whiplash test. Kobie also helped fabricate the cleats used on the wheels of another Mars Rover, the Sojourner. 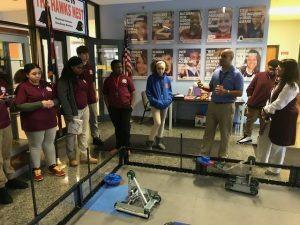 During his career, Kobie has been responsible for the design, fabrication, and building of the Solar Arrays (like solar panels) for the Mars Rover. 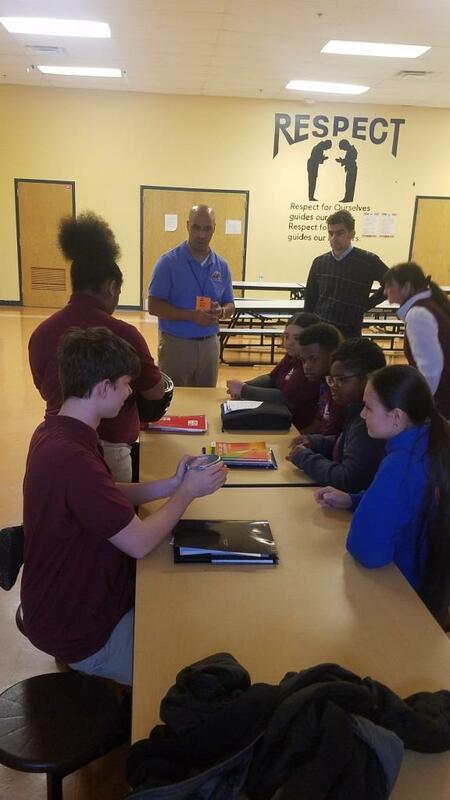 He was also the ATLO, or Assembly, Test, and Launch Operations engineer responsible for working with the team to build Spirit and Opportunity at Cape Canaveral, Florida. Basically, Kobie designs and builds the moving parts for the Mars Rovers. He’s part of a big team of more than 5500 people who collaborate to make the Mars Rovers missions come true. 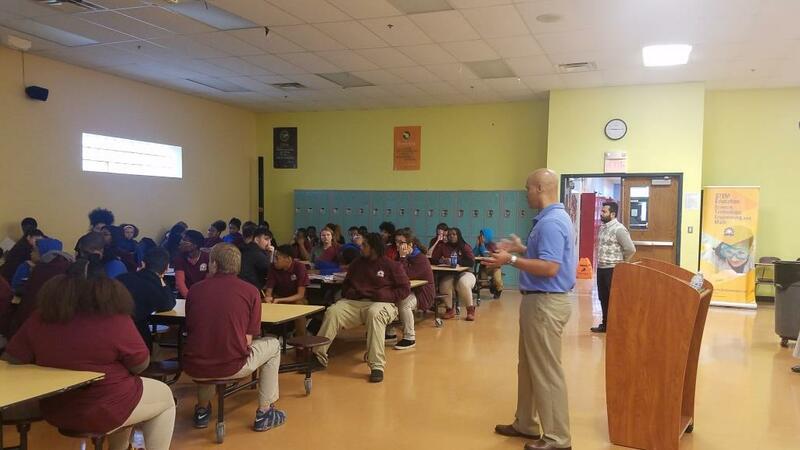 As a color of person, Mr. Boykins talked to HSA’s high school students and encouraged them to work hard. It is because what they are doing now is the most important for their future. 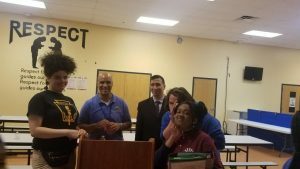 Mr. Boykins also encouraged HSA students to apply for grants and scholarships as there are unclaimed several billions of dollars of scholarships each year. 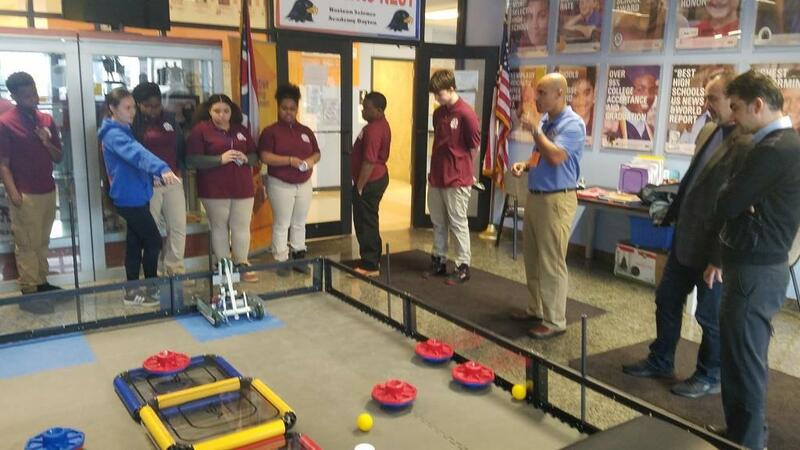 Mr. Boykins also met Horizon’s robotics team and asked questions about their robots. 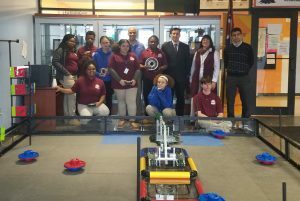 He congratulated the students for their hard work and dedication in building their robots. 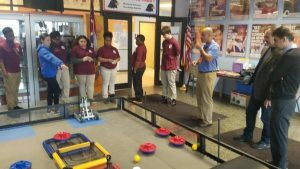 Mr. Boykins also pointed out that it is very important being a part of a team and improving such technical and social skills. That is how they worked at NASA when sending the Pathfinder to Mars. 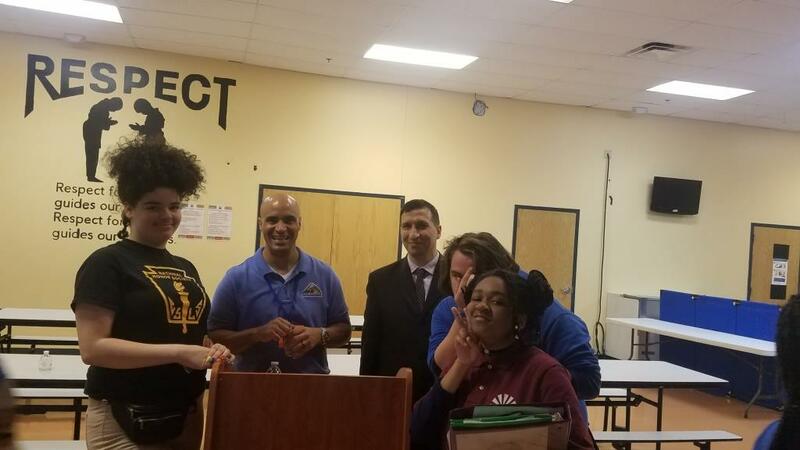 Kobie recently told Horizon Staff member Ms. Gollin-Hoepfl, “Ask for the moon and deliver the stars!” With Kobie’s visit to Horizon, we had one of NASA’s stars in our midst. We give thanks to National Geographic and the Dayton Arts Alliance for sponsoring Kobie’s trip to Dayton, and to Kobie and his sponsors for Kobie’s visit to our school.